Technically speaking, H&H will go wherever the project takes us. 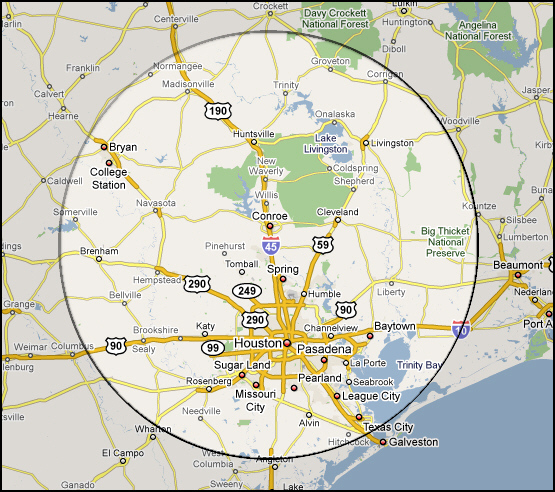 However, for practical purposes, our primary service area is Southeast Texas, specifically those areas that fall within a 50-75 mile radius of our home base in Conroe, located in central Montgomery County, Texas. 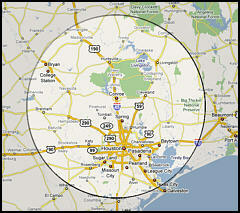 See image to right for a closer view of our primary service area. Those areas closest to the center generally do not require any additional travel charges, which could apply as you move closer to the edge or outside the circle entirely. Once again, I want to thank the H and H Tree Service for the outstanding professional job they did today. In less than 24 hours, my call was returned, we set up the date and time, and the crew arrived and did an amazing job of removing (and cleaning up) 2 very large trees…my family has used their service for years…I highly recommend them. Thank you Dennis and Nathan as well as your crew. Copyright 2013 H and H Tree Service. All rights reserved.